I am sure all kids are different. I totally get that. But some of the differences between boys and girls still shock me, and make me smile. 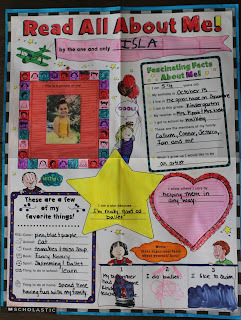 Isla was so excited when she got to bring home her all about me poster to decorate. She wanted to waste no time and start working on it as soon as we got home. Her one request was that it was colorful. She was so into picking the different colors, coloring and drawing little pictures. I'm pretty sure her enthusiasm was much greater than Connor's two years prior. Also, she cares about coloring in the lines and completely much more than Connor did. I totally did NOT school her on those answers and those last two totally caught me off guard. Sweet girl. 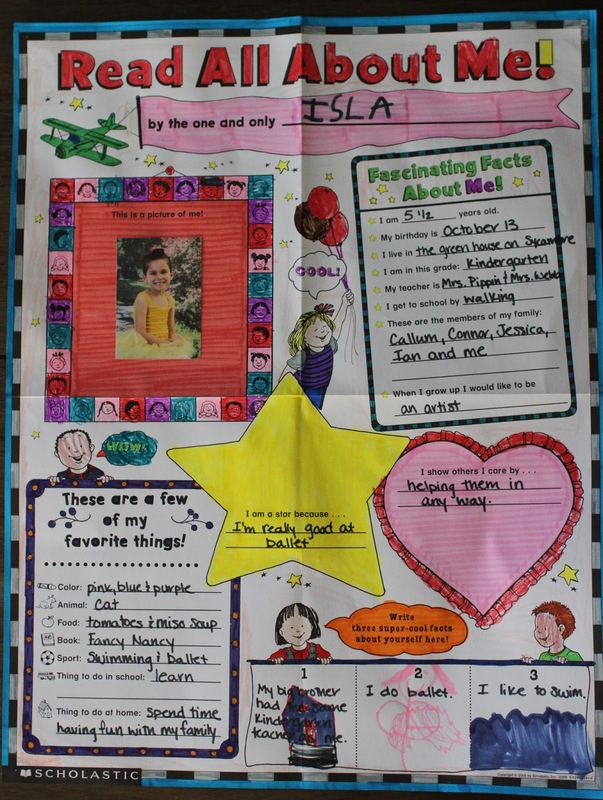 Let us take a moment to enjoy Isla writing her name in all caps, because it will probably be a last, given that they are now making her write it "properly". I will miss seeing that all caps name with the "S" that has changed and improved so much over the past two years that she has been writing. I always try to not sway the kids answers on these types of things. I love hearing about their true likes and dislikes. Also, I love hearing about the things that they are proud of. It's really cute and such a good snapshot of their lives at this exact moment. It won't be for much longer that Isla identifies our house as "the green house on Sycamore" or wants to be so many things that it's hard to decide. But kindergarten man, it's such a cute age and precious little moment in time.